We are often approached to organise something spectacular, something unforgettable, something complicated and something remote. Sometimes, we are asked to organise something with all these elements. It might be a 40th birthday on a beach or a wedding anniversary in the desert or a family reunion in the mountains. The requirements of each event are different but each has the overriding quality of being truly unique. One such event was a 50th birthday that was being organised in secret by the wife of the ‘quinquagenarian’. An event for 30 people, wanting to party on a beach and then sleep on the beach in tents? How hard could that be? Well, it turned out that there were a few challenges, such as low tide which meant the fishing boats could only be pulled across the shallow lagoon – this was fine for the large and delicate birthday cake but not for our timekeeping. Nevertheless, we had factored in enough contingency that, by the time the guests arrived, by dhow, having enjoyed sunset across the ocean on board, we were ready. The camp had been set up on a small beach, sheltered on either side by rocky outcrops. We covered the rocks with candles of all shapes and forms and organised a local band to play upon the guests’ arrival. The combination of subtle light and eerie oud melodies stretching across the flat waters made for a magical welcome. Guests were ferried from the dhows to the beach in fishing boats where they were met with cool hand towels and appetisers. Roy had been slaving away all afternoon to prepare the assado, a splayed goat (or, in this case, lamb) cooked over an open fire. 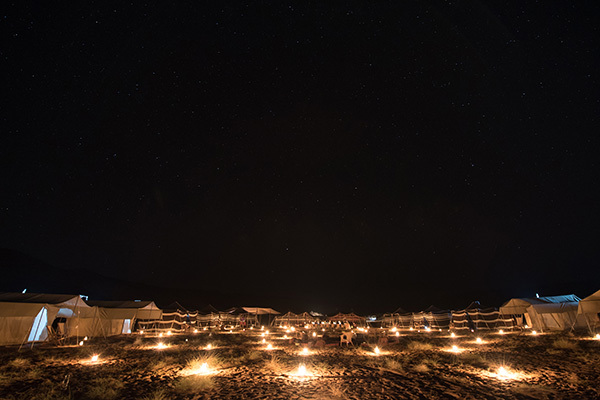 The guests explored the camp and the beach, a few paddling in the warm water, others settling into majlis tents and others inspecting Roy’s handiwork. The three course meal, served at one long table spread across the beachfront was a great success and was followed by some questionable disco dancing and shisha. Some guests were local residents of Muscat who departed by boat back to their cars after dinner. The remaining guests settled in for the night, stealing a few hours’ sleep before the sun rose, painting the rocks pink. A lazy morning of resting tender heads and snorkeling was too soon over and the guests were on their way back to hotels and airports.